Welcome to the Monday Montage blog hop! Every other Monday, my friends and I share inspiring projects. Be sure to visit all 10 stops.....you don't want to miss anything! Today I'm featuring a suite of products from the upcoming Occasions catalog. You are going to fall in love with the It's My Party line ~ it's perfect for any and all birthday celebrations. I started by stamping "Happy Birthday" from the Party Wishes stamp set in Mint Macaroon ink onto Whisper White cardstock. I then stamped several balloon strings above the "Y". On a scrap piece of Whisper White cardstock, I stamped a candle in Mint Macaroon ink and 3 balloons in Melon Mambo, Crushed Curry and Mint Macaroon inks. 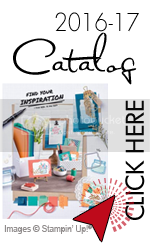 There is a new Party Punch Pack that made it quick and easy to punch out the candle and balloons. I then adhered them to the card with Stampin' Dimensionals. The final touches include banners of Dazzling Diamonds Glimmer Paper and It's My Party Designer Series Paper, plus a bow of Basic Black/Mint Macaroon Bakers twine. 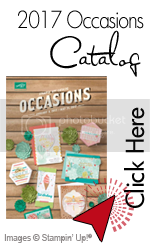 Occasions Catalog products will be available to purchase on January 5th, 2016. Be sure to visit all 10 stops on the hop. Click next to see what the Wonderful Wendy has created or click back to check out Kreative Kaitlyn.